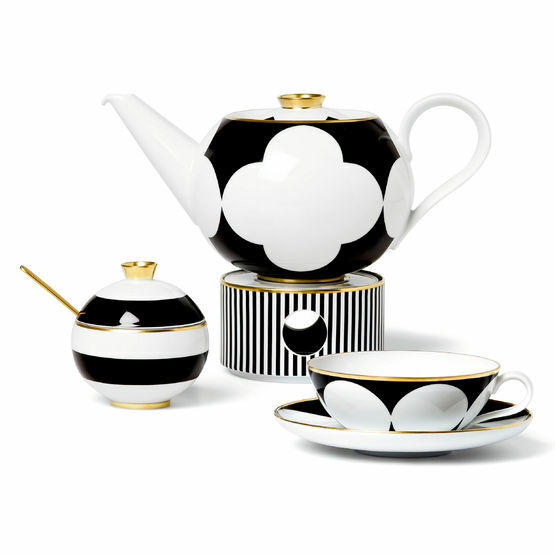 Ca D'Oro by Sieger for Fürstenberg - a bold, contemporary china pattern in black, white and burnished gold is inspired by the opulent Ca D'Oro palace in Venice. The collection is based on the Gothic element of quatrefoil, a form that consists of 4 circles and bears an abstract resemblance to a flower. Each piece has it's own design, but all are meant to coordinate for harmony and elegance. Ca D'Oro may also be coordinated with Treasure Gold dinnerware. Shipping is approximately 2-3 weeks from order date. Ca D'Oro Charger/Presentation Plate 12.5"
Ca D'Oro Bread and Butter Plate 7"
Ca D'Oro Espresso Saucer 5"
Ca D'Oro Sugar Bowl 6 oz. Ca D'Oro Milk Jug 7.75 oz.